Summary: New York Times bestselling author Jennifer Chiaverini celebrates Christmas, past and present, with a wondrous novel inspired by the classic poem “Christmas Bells,” by Henry Wadsworth Longfellow. I know it might seem a little early to be reviewing a Christmas book here at Booking Mama, but I can promise you that the holiday will be here before we know it. And what's better to get you in the festive spirit than a heartwarming Christmas story? New York Times bestselling author Jennifer Chiaverini has written a sweet novel called CHRISTMAS BELLS that's just perfect for this time of year! CHRISTMAS BELLS was inspired by the classic poem "Christmas Bells" by Henry Wadsworth Longfellow. The story goes back and forth between the present and the past and links the stories of various church members with Longfellow's life in the 1860s. The novel begins in Boston with Sophie, a music teacher whose life isn't going exactly to plan. The music program at her elementary school has been cut due to budget constraints and she will soon be out of work. In addition, she has some personal issues (i.e. her love life) that she needs to figure out. She manages to push aside her concerns as she prepares the children's choir for their Christmas Eve concert. Naturally, the kids will be performing the carol "Christmas Bells" written by local artist Henry Wadsworh Longfellow. 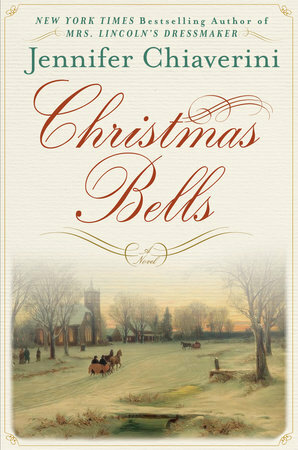 CHRISTMAS BELLS also shows Longfellow's life in 1863 when a horrible tragedy hits his family. To make matters even worse, the country in on the brink of war. Longfellow struggles to keep his patriotism, faith and family together despite the troubles they face. In addition to Longfellow's and Sophie's stories, the novel also features vignettes of various members of St. Margaret's church. The reader is introduced to the challenges that children in the choir, their parents, parishioners, the priest and even a nun face. All of the stories in CHRISTMAS BELLS are linked in some way and promise to touch your heart this holiday season. It's been awhile since I've read a novel by Ms. Chiaverini, and I was quickly reminded why I loved her novels so much. She manages to link the present and the past effectively, but she also weaves beautiful tales about people. I knew next to nothing about Longfellow's life, so I found his story to be fascinating; however, it was the touching stories about the present day church members that really warmed my heart. And that's what I most loved about CHRISTMAS BELLS -- the way this book made me feel. During the holiday season, it's so easy to get caught up in the hustle and bustle and the preparations. I need books like this one to ground me and remember the what's important to me during this time of year -- family, friends, and church. Ms. Chiaverini really brings the various church members to life through these vignettes and their stories will definitely resonate with readers. CHRISTMAS BELLS would be a great pick for your December book club. While the book does present Longfellow's story which many will find interesting, it really shows the kindness of the human heart... and who doesn't need an uplifting story like that during the holidays? Highly recommended! Yes, it's always wonderful to read a book that makes you feel like that this time of year. Although her name sounds a little familiar, I don't think I've read any of this author's books before. This one looks like a great Xmas vacation read!